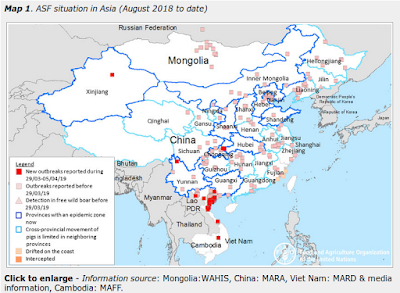 The unusually severe summer flu surge which was first reported in Hong Kong in early May (see Hong Kong CHP Reports A Late Season Flu Surge), and shortly thereafter in Taiwan (see here & here), continues to spread, with reports of increased flu activity in Macao and across much of Guangdong Province on the mainland. Today, for the second time in three days, Hong Kong's CHP has again appealed for vigilance against flu, after reporting two more severe pediatric cases yesterday. In today's statement they also reference the high levels of flu being reporting now in Guangdong Province and in neighboring Macao. Given their close proximity, and the amount of travel between these locations, this spread is not unexpected even if the severity and timing of this flu outbreak are unusual. A round up of reports this morning, first from Hong Kong, then Macao, and finally Guangdong Province. The Centre for Health Protection (CHP) of the Department of Health today (July 19) reported that local seasonal influenza activity further increased to a very high level in the past week, coupled with ongoing severe influenza cases, high consultation rates in sentinel clinics/doctors and a large number of institutional outbreaks. "The latest surveillance data of the summer influenza season showed that the rate of influenza-like illness in Accident and Emergency Departments and the influenza-associated admission rate in public hospitals remain high. Influenza activities in Guangdong and Macau are also high. As local influenza is expected to remain very active in the coming weeks, we strongly urge the public, particularly children, the elderly and chronic disease patients, to adopt strict personal, hand and environmental hygiene both locally and during travel in the summer," a spokesman for the CHP said. The positive percentage of seasonal influenza viruses among respiratory specimens received by the CHP further increased from 35.87 to 40.66 per cent from the week of July 2 to that of July 9. The vast majority (92 per cent) was influenza A(H3). "Epidemiological experience shows that the predominance of H3 virus has affected elderly persons most, many of whom have underlying illnesses, as observed from more outbreaks reported by elderly homes. They should promptly report to the CHP in case of an increase in respiratory illnesses for immediate epidemiological investigations and outbreak control," the spokesman added. In the above period, the number of institutional outbreaks of influenza-like illness increased from 42 (affecting 234 persons) to 44 (229 persons). As of yesterday (July 18), 16 (83 persons) had been recorded this week. In the last four weeks, about half of the outbreaks (53 per cent) were reported by residential care homes for the elderly, followed by about one-fifth (21 per cent) from kindergartens and child care centres. Regarding severe influenza cases, in adults, 289 cases of influenza-associated admission to the Intensive Care Unit or death (including 199 deaths) were recorded with the Hospital Authority and private hospitals during the enhanced surveillance from May 5 to yesterday. Most (249 cases) were H3. In children, 23 cases of severe influenza-associated complication or death (four deaths) have been detected so far in 2017, with 16 H3, six H1, and one influenza B cases. "Hong Kong has entered the summer influenza season since mid-May. The public should wash or clean hands frequently, especially before touching the mouth, nose or eyes, or after touching public installations such as handrails or door knobs. Wear a mask when respiratory symptoms develop, especially when going to crowded places or attending gatherings. High-risk persons may wear masks against infections," the spokesman said. "Young children aged six months or above yet to receive seasonal influenza vaccination of the current season may get vaccinated as soon as possible for better personal protection," the spokesman added. In addition, influenza activities in neighbouring areas remained high with H3 virus predominating so far. Macau has entered the summer influenza season. Influenza activities in southern provinces of the Mainland have been on the rise recently. In the southern hemisphere, influenza activity in Australia and New Zealand is rising. To put this summer wave's severity into perspective, during Hong Kong's regular flu season (Jan-April 2017) they reported just 66 adult severe cases and 41 deaths. Over the past 10 weeks those numbers have more than quadrupled. Yesterday in neighboring Macao, which has only about 1/12th the population of Hong Kong, their Health Bureau issued a lengthy statement on their recent flu surge as well. The Health Bureau said it was closely monitoring the situation of the flu in Macao. According to the monitoring data, Macao has entered the summer flu peak, influenza virus activity is active, Macao has recorded severe cases of influenza and death cases. In response to the peak of the flu, the Secretary for Health, Mr Lee Chin-lun, today (July 18) convened a meeting to review the current response to the relevant departments and will take a series of measures to enhance the peak of influenza. The Health Bureau urges members of the public, medical staff, medical institutions and residential homes to take precautions to prevent the changes in the disease. In order to monitor the influenza situation in Macao, the Health Bureau has set up a tight monitoring mechanism. The monitoring revealed that influenza-like illness in Macao increased significantly compared with the same period of last year. Among them, the hospital influenza surveillance data show that the latest week in Australia (28 weeks) the number of influenza-like cases increased, including adult emergency due to influenza-like cases, the proportion of total attendance per person, 117 times per person, about Usually 4 times; and the proportion of pediatric emergency for every thousand people 214 times, about 2 times the normal day. The Department of Health's Public Health Laboratory will also isolate the respiratory samples of influenza-like illnesses. The results showed that 57 of the respiratory samples of 127 influenza-like illnesses collected by the Public Health Laboratory in the past week were positive for 57 influenza viruses (41.9%), 11 (19.3%) of influenza A virus and 4 (7.0%) of influenza A (H1N1) virus samples. The positive rate was 44.9%. While not hit as hard as Hong Kong, the following chart from Macao's latest Influenza Surveillance report shows influenza's upward trend in June at a time of the year when flu is normally declining. Meanwhile, in Guangdong Province (pop 108 million), where official statistics are harder to come by, Guangdong's CDC website did publish the following media report yesterday. Their short-term forecast - of flu levels falling to their baseline levels by the end of July - is considerably more optimistic than Hong Kong's. Xinhua News reporter Li Qiuling correspondent Liang Ning interns Cao Zhenzhen reported that the new Express reporter learned from the Guangdong Provincial Center for Disease Control and Prevention, Guangdong is still at the peak of seasonal influenza, the recent monitoring data show that the overall incidence of influenza in Guangdong Province Began to show a downward trend, is expected in late July will gradually fall to the baseline incidence level. Guangdong Provincial Center for Disease Control and Prevention, deputy director of Song Tie told reporters, according to the center of the outbreak of influenza outbreak monitoring data show that since January this year, the province's influenza-like cases outpatient clinic (ILI%) 4.19% , Down by 10% from 4.65% in the same period last year. The highest level of influenza-like illness was in late June and ILI% was 6.63%. But from the monitoring point of view, since mid-July began to decline. Song Tie said that according to previous years of monitoring analysis, the flu epidemic is expected at the end of July will gradually fall to the baseline incidence level. Disease control experts also introduced this year, the advantages of influenza in Guangdong strains of influenza A H3N2 influenza virus, accounting for 75% of influenza outbreaks. "In general, every year from May to July is the seasonal season of influenza in Guangdong Province at this stage of the province's seasonal influenza virus is still active, but with the gradual decline in the proportion of influenza-like cases and the arrival of summer vacation is expected to province schools The outbreak of the epidemic will be significantly reduced, but it should be noted that the summer camp and centralized training institutions still exist the risk of aggregation of influenza. "Song Tie also said:" September after school children re-gathered, schools, nursery institutions will have The occurrence of respiratory and intestinal infectious diseases, the risk of aggregation of the epidemic, the relevant departments should be done before the school prevention and control work. Meanwhile, as reported yesterday in this blog, the regular flu season in the southern hemisphere is picking up steam.